We’re excited to announce that DeNA has selected Fyber as its leading mobile ad monetization partner in the United States. DeNA is a global Internet company that develops and operates a broad range of mobile and online services including games, e-commerce, and other diversified offerings. Founded in 1999, DeNA is headquartered in Tokyo with offices and game development studios across the globe. Late last year, DeNA began working with Fyber to test the effectiveness of various mobile ad monetization strategies including rewarded video, interstitials and offer walls. The test was deployed on two apps – Super Battle Tactics and TRANSFORMERS: Age of Extinction – in both the iOS and Android gaming environments. 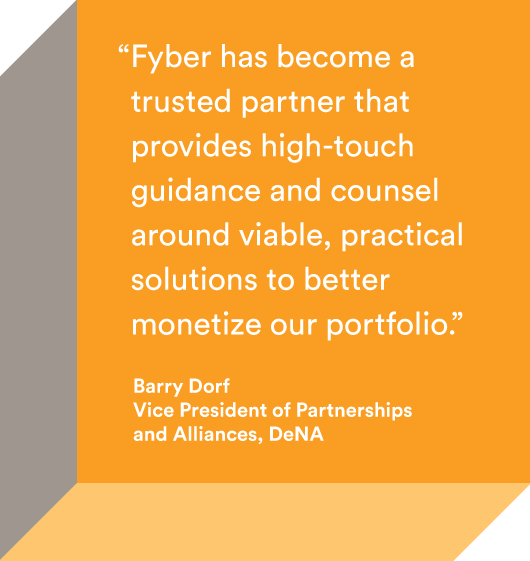 The implementation immediately drove strong results in terms of increased engagement, video views, and revenue growth, resulting in Fyber being selected as DeNA’s chosen monetization provider. This announcement comes on the heels of Fyber’s GDC Fireside Chat, where Alex Wilhelm of TechCrunch, DeNA’s Barry Dorf and Fyber’s David Diaz will share and discuss their thoughts on the future and trends of game monetization and the role that advertising will play as part of the monetization mix. If you’re attending the conference, we invite you to join us for this or one of three other sessions that we will be hosting! If you are not able to attend one of the sessions, but would like to meet with a member of our team, click here to set up a meeting. Look forward to seeing you at the show!